Pearl Street Bagels doesn’t toast their bagels because a crew of bakers makes them fresh all day long. 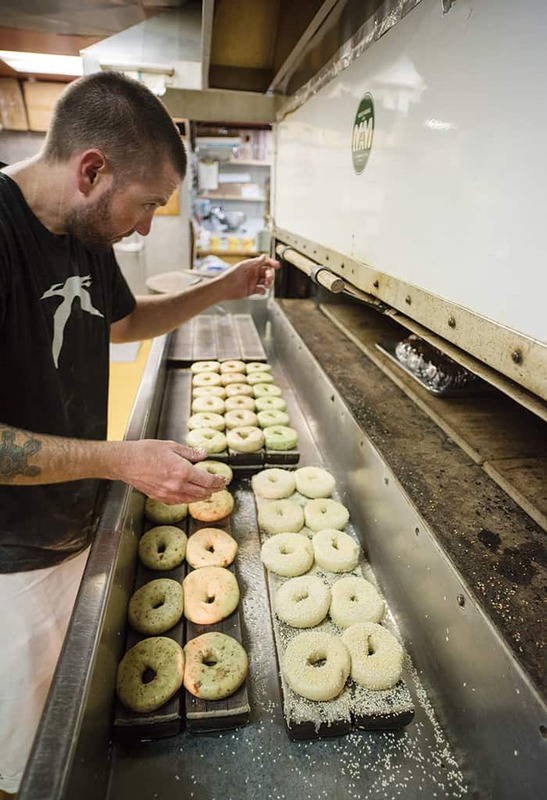 Matt Berube prepares racks of boiled bagels for baking at Pearl Street Bagels’ town location. THE SMELL IS intense. Make that Intense. Capital I. If the beginning of life had a smell, it would be like the one wafting in the kitchen of the downtown Pearl Street Bagels location—a mixture of moisture, yeast, and malt that is primordially fertile. Walking into this kitchen is like walking into a loaf of fresh bread. In addition to the smell, the small space is hot, anywhere from 80 degrees to 90-something, depending on the season. Even when it’s zero degrees outside, opening the back door can only do so much against a 400-degree oven. Maggie and Les Gibson founded Pearl Street Bagels (PSB) in 1990. While in college in Burlington, Vermont, Maggie was introduced to real bagels and learned how to make them. After several years in Jackson Hole, she began missing bagels enough that she decided to make them herself. Pearl Street Bagels was an instant hit. In 1996, the couple opened an outpost in Wilson. For eighteen years, Maggie and/or Les could be found in one of the two locations most every day. And then it was time for them to move on. In 2008, three PSB employees—Brevan Daniel (kitchen manager), Polly Danz (Wilson manager), and Heather Gould (office manager) purchased the business. (As of last September, Danz and Gould bought Daniel out.) Aside from Maggie and Les no longer being around, customers noticed little difference after the sale. Pearl Street Bagels still made the best bagels in the valley, was a great space for aspiring local artists to show their work, had some of the friendliest baristas around, and refused to toast bagels, instead baking them fresh throughout the morning. Ryan Coleman dices onions during his prep shift at Pearl Street Bagels’ town location. 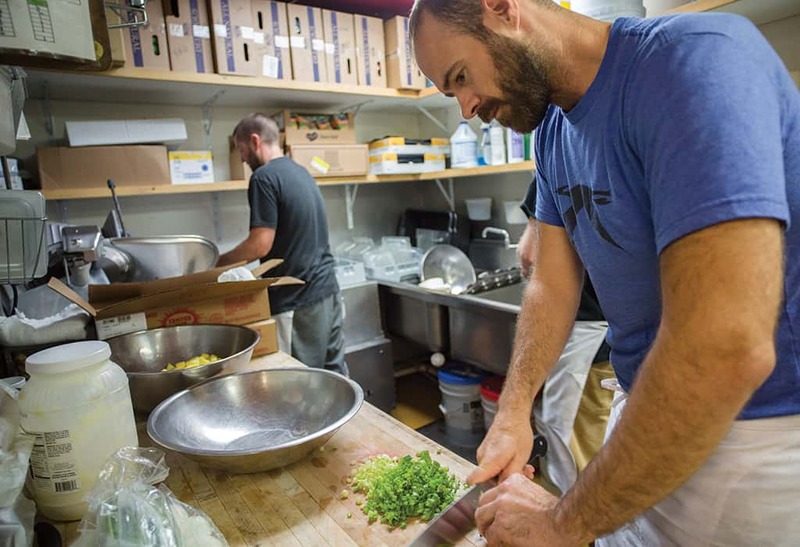 WHEN MATT BERUBE comes in at 4:30 a.m. for the bake shift, his responsibilities include the first bake, making the first round of breakfast sandwiches, and baking all of the cookies. Pearl Street Bagels mixes all of the flavored cream cheeses—Mexican, honey walnut, fresh herb, and berry—it serves in-house. THAT’S JUST THE bagel baking. You have to have dough to bake. In the winter, bakers make dough three days a week. In summer, it’s four days a week. The downtown location makes the bagel dough for the Wilson location as well, but all of the bagels sold in Wilson are baked and boiled there. The mixer is as big as the kettle. Each batch of dough includes one hundred pounds of flour, malt, salt, and yeast and about twenty pounds of water. This makes enough dough for six hundred bagels, which fills one rack. In the winter, the goal is to make four racks on each dough-making day. Once the dough is mixed, it goes into the “bagel machine.” “Technically, it’s called an automatic divider/former; we just call it the ‘bagel machine,’ though,” Gould says. This machine does what its name suggests: it forms blobs of dough into bagels, each perfectly round with a small hole in the center. It does this at the rate of thirty bagels a minute. “Catching them is mindless, but you have to be on it,” Coleman says. The bagel machine has to be on it, too. “When we bought the business, we were using the original machine that Les and Maggie had bought used in 1990,” Gould says. 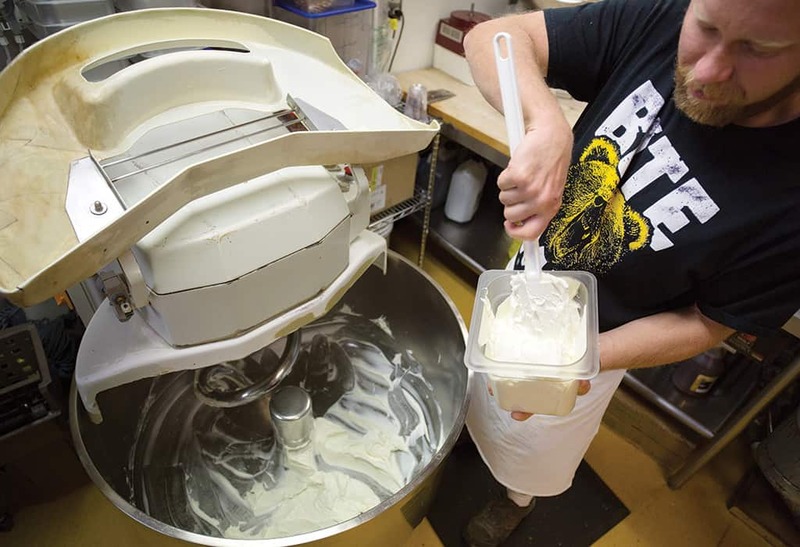 “It had developed lots of issues, which made dough days very stressful. There aren’t many people around here who work on them, so our bakers have figured out how to solve any glitches that arise. It is high-stakes. 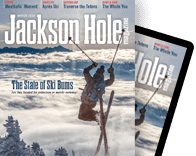 Since we’re a bagel shop, having bagels is pretty basic!” A new bagel machine was bought several years ago, “but it came with new and different issues,” Gould says. “It took some getting used to, but the bakers are able to troubleshoot any issues that arise really well now.” All three of the current bakers—Berube, newbie Nelson Jones, and Bob Sanders, a baker for fifteen years and also the kitchen manager—are comfortable tinkering with the machine, but Gould says Sanders is the bagel machine whisperer. 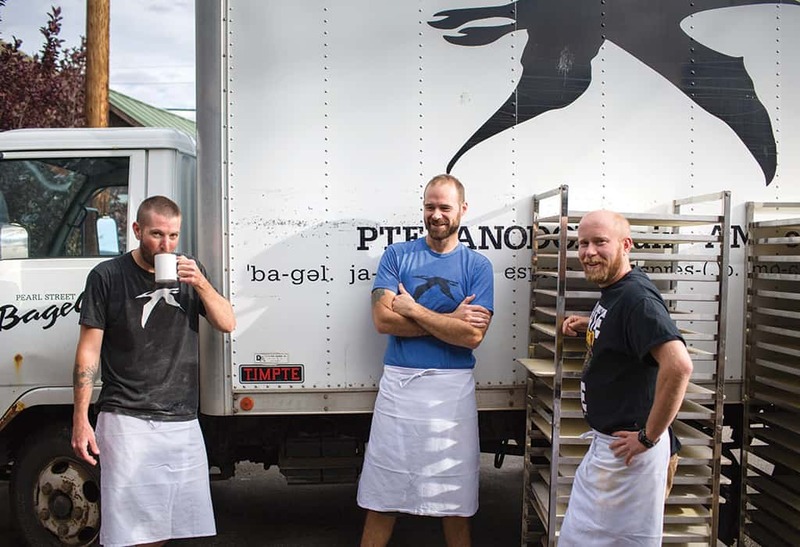 Three bakers (from left), Berube, Coleman, and Rob Denton take a break last summer outside the downtown location. Once it becomes apparent to me that Coleman isn’t going to miss a bagel coming down the bagel machine’s treadmill—resulting in a bagel version of the famous I Love Lucy chocolate factory scene—I decide I’d rather enjoy a bagel out front than stand beside him for the twenty-some minutes it takes to fill a rack. Since Pearl Street doesn’t toast bagels, I go with what is freshest. The sesame bagels aren’t merely fresh but still hot. The barista slices one in half and then half again. Steam rises when she pulls the halves apart, proving that fresh is indeed better than toasted.